When I was younger, I would have never thought that sports would ever be a central part of any of my profiles, but over more than a decade now, martial arts, particularly Wing Chun, has even become a central aspect of my life. 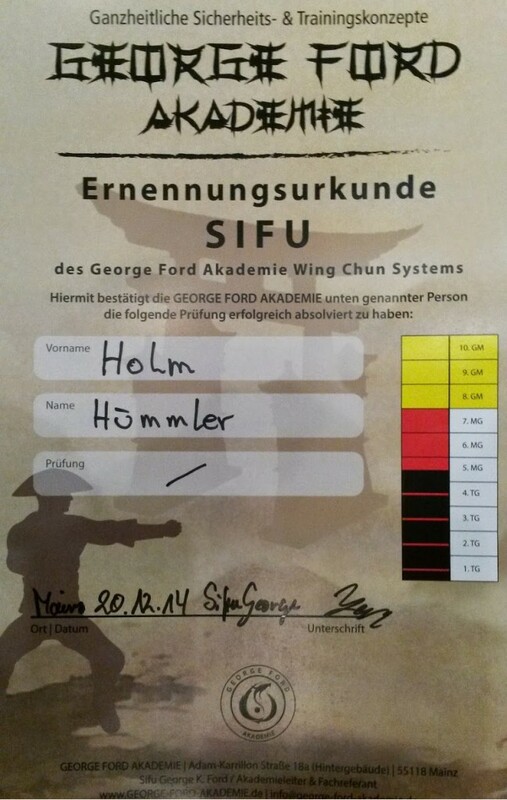 I have been a regular student first at Hochschulsport at Frankfurt University, later in the European Wing Tsun Organization (EWTO), Hatra Wing Tjuen Academy, and now, I study and occasionally teach at the George Ford Akademie in Frankfurt and Mainz. Since 2014, I can officially call myself Sifu (teacher). My regular teachers and guides at different stages of on my voyage through martial arts have been Sifu Klaus Haas, Sifu George Ford, Sifu Christian Trarbach, Sifu Thorsten Lippert and my first sihing Christian Einicke. In workshops and seminars, I have been fortunate to learn from some very interesting experts in the field, including Wing Tsun Grandmaster Leung Ting, EWTO Grandmaster Keith Kernspecht, Snake Crane Wing Chun Sifu Wayne Yung, Hung Gar Master Ho Hung Sun, knife survival trainer Marco Reh and IDF Special Forces Sergeant and Krav Maga instructor Kfir Itzhaki.